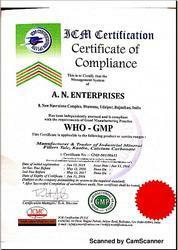 We have been certified by GMP. 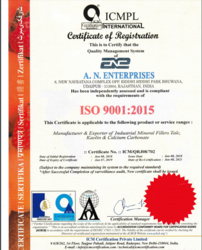 Quality is the nerve center of our organization, and thus we make sure that we never compromise on quality. Sampling of the ore is done systematically from time to time and these are tested for complete mineralogical and chemical composition. It is also ensured that the elements important for our clients are there in our products and the powder properties are also measured regularly to suit the requirements of our clients. The whole processing includes procurement of ore from the mines and checked for important chemicals and elements. The ore is washed and dried to remove the unwanted foreign particles. Then, the ore is blended to get the exact properties. The blended ore is then ground to the required particle size. Being one of the client centric organization, we have directed all our efforts towards achieving maximum client satisfaction. We make sure that the products are of the optimum quality and serve that purpose of the clients to the fullest. Moreover, for the convenience of our clients we custom pack our products according to the specifications laid down by them.